Reindeer expert, Isaac Bott, a veterinarian from Springville and a Utah State University alumnus, will bring reindeer to Cache Valley. Bott is the leading authority on reindeer health and will make sure they are ready for their Christmas Eve journey. Reindeer Express is returning to the Utah State University’s Animal Science Farm’s Indoor Arena at 3580 South Hwy 89/91 Wellsville, Utah, Friday, Nov. 30 from 2:30 p.m. until 7:30 p.m.
One of two reindeer at last years Reindeer Express that came to Cache Valley so people could be introduced to the animals. “We thought it would be best if we had scheduled times to regulate the crowds,” said Lynette Harris, who works for the USU College of Agriculture and Applied Sciences. “As soon as we announced the schedule, it filled up. “We have opened a waiting list. Interested parties can go to USU Veterinary Medicine Facebook page,” Harris said. Scheduled families will have the opportunity to see Santa’s reindeer, along with horses, donkeys, cattle, and camels. Children can also visit with Santa and Mrs. Claus and drop off letters for Santa to read when he gets back to the North Pole. Local choirs will be on hand to sing holiday music throughout the event. Other holiday activities will include horse and carriage rides for families to enjoy. 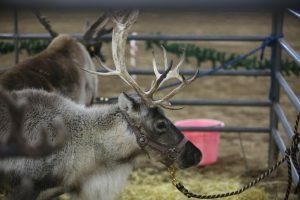 Reindeer expert, Isaac Bott, a veterinarian in Springville, Utah, and a Utah State University alumnus, is bringing the animals to the valley. Bott is the leading authority on reindeer health and he will make sure they are ready for their Christmas Eve journey. He successfully produced the world’s first female reindeer calf through artificial insemination. The calf’s name, Mira, stood for miracle. “I was just driving down the road one day, and I got a random phone call from a guy,” Bott said. When Bott visited the farm, the reindeer was, in fact, in active labor. Bott was able to successfully deliver the calf, and later the owner approached Bott about artificial insemination to grow his reindeer herd. He accepted the challenge and was successful in producing the world’s first female reindeer calf. Harris said USU is trying to resolve the issue of letting more of the public experience Reindeer Express.